When Chinese Ambassador Luo Zhaohui described his teacher Xu Fancheng during his visit to Puducherry’s Sri Aurobindo Ashram and Auroville in September, senior inmates of the ashram got a rush of memories of a lanky, reserved man who used to cycle around the town wearing a headband with a visor. Chinese professor Xu Fancheng, an Indologist and artist spent 27 years at the Sri Aurobindo Ashram, teaching at the Ashram School and translating the works of Sri Aurobindo and the Mother into Chinese. Zhaohui regarded Xu as one of the bridges between the two nations. Born as Hu Hsu on October 26, 1909, in Changsha, Hunan Province, China, Xu settled down in the Sri Aurobindo Ashram in 1951 after a brief stint in Germany where he studied art and history at Heidelberg University (1929-1932). 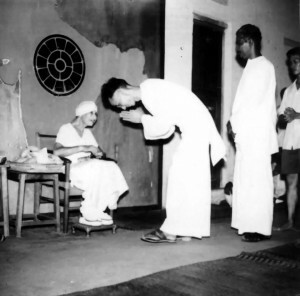 Xu first came to India to teach at Rabindranath Tagore’s Visva Bharati University in West Bengal in the late 1940s. During his stay, he studied classical Sanskrit in Varanasi and translated Kalidasa’s ‘Meghaduta’ into Chinese. His quest for Indian philosophy and scriptures drew him to Puducherry. “Settling down in Sri Aurobindo Ashram in 1951, he lived a life of solitude and intense learning and seeking. He painted in the classical Chinese style, practised calligraphy and began translating the works of Sri Aurobindo and the Mother into Chinese,” says Devdip Ganguli, a member of a group in Auroville and Ashram, who organized an exhibition of Xu’s paintings in 2010 at Auroville to mark his birth centenary year celebrations. Zhaohui while in Puducherry visited the gallery in the ashram where the paintings of Xu have been preserved and displayed. While addressing a gathering at the recently held 68th anniversary celebrations of the People’s Republic of China at New Delhi, Zhaohui compared his teacher with Buddhist monks Bodhidharma, Faxian and Xuanzang, who engaged in bilateral ties in their quest for spiritual knowledge. Xu has been often credited with not only introducing Indian philosophy to China but also inspiring Chinese universities to teaching the works of Sri Aurobindo. “He firmly believed in the spiritual message of Sri Aurobindo that proposed India to maintain a universal brotherhood with all countries,” says another ashram inmate. Xu returned to China in 1978 after the Cultural Revolution in his country. He joined the Institute of World Religions, a department in the Chinese Academy of Social Sciences, as a faculty. His later years were spent leading a quiet lifestyle, focusing on his own work and helping fellow-seekers. Xu passed away on March 6, 2000.